Craving Carrot Cake? 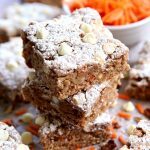 Then you are going to LOVE these easy Carrot Cake Ooey Gooey Cookie Bars. It’s the perfect combination of cake and cookie! This is definitely a fabulous recipe to make on Easter or any day of the year. Preheat oven to 350 degrees. Line a 9 x 9 pan with parchment paper or spray with nonstick cooking spray. In large bowl, cream butter and cream cheese together. Add egg and and continue to beat. Add cake mix and mix until well combined. Stir in your mix ins. I added shredded carrots, white chocolate chips and pecans. Press dough into prepared baking pan. Bake for 15-18 minutes or until edges are brown.